PSALMS 100:2 KJV "Serve the LORD with gladness: come before his presence with singing." 1(A Psalm of praise.) Make a joyful noise unto the LORD, all ye lands. 2Serve the LORD with gladness: come before his presence with singing. 3Know ye that the LORD he is God: it is he that hath made us, and not we ourselves; we are his people, and the sheep of his pasture. 4Enter into his gates with thanksgiving, and into his courts with praise: be thankful unto him, and bless his name. 5For the LORD is good; his mercy is everlasting; and his truth endureth to all generations. Serue the Lord with gladnes: come before his presence with singing. 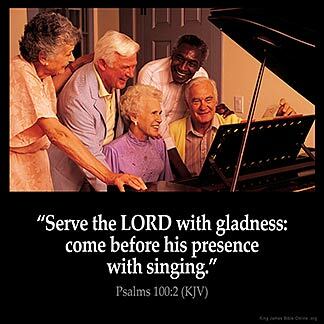 Serve Jehovah with gladness: Come before his presence with singing. Give worship to the Lord with joy; come before him with a song. Serve Jehovah with joy: come before his presence with exultation. Serve Yahweh with gladness. Come before his presence with singing. Serve Jehovah with joy, come before him with singing. We should be joyful because God have done excellent things for us. He truely cares for us. So I encourage you to always radiate with joy. We should serve God with joy and not just out of a sense of duty. God is a happy God and he wants his servants to serve him in a joyful way.